Science, technology, engineering, art and mathematics — building blocks to innovation, inspiration and driving positive change into the 21st century. It’s an exciting time to be in these fields collectively known as STEM, or STEAM, which includes art. 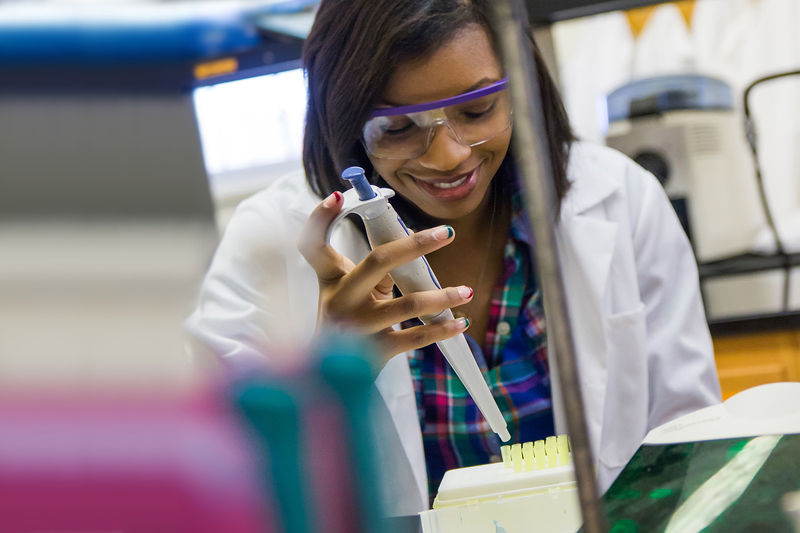 William Woods University is home to a number of areas of study in the world of STEM/STEAM — whether you’re an undergraduate student looking to start a career in an exciting, emerging space, or a graduate student, eager to add an understanding of STEAM into your repertoire. Our dedicated faculty, community and staff is committed to growing your opportunities in STEAM — preparing you to flourish in any innovative field. What happens when you mix science, technology, engineering, art and math with firm grounding in the liberal arts? You uncover innovation. You bring context and creativity to discovery, and create a better world. According to the Bureau of Labor Statistics, employment in STEM occupations grew by 10.5 percent, or 817,260 jobs, between May 2009 and May 2015, compared with 5.2 percent net growth in non-STEM occupations. Ninety-three out of 100 STEM occupations had wages above the national average. The STEM group that is projected to grow fastest from 2014 to 2024 is the mathematical science occupations group at 28.2 percent, compared with the average projected growth for all occupations of 6.5 percent. This group includes occupations such as statisticians and mathematicians. Others among the fastest growth areas include STEM-related postsecondary teachers, computer occupations, management, and physical scientists. These are jobs in computer science and systems, engineering, life science, technicians, architects, industrial designers and more — some are jobs that don’t exist yet. Some are jobs with more openings than workers. William Woods University is home to unique laboratories, centers and incubators for creative ideas. Participate in the Genomics Education Partnership; a classroom based research experience in our dedicated DNA sequencing and genetics lab. Spend time with passionate peers and mentors in honors societies and involvement organizations devoted to STEAM. Being a math major at William Woods was a great experience for me. The class sizes were small, which made it feel more personal, and it was easy for us to get a lot of one-on-one help from professors. These small classes also prepared me for my graduate studies by allowing me ample time and opportunity to grasp the information.